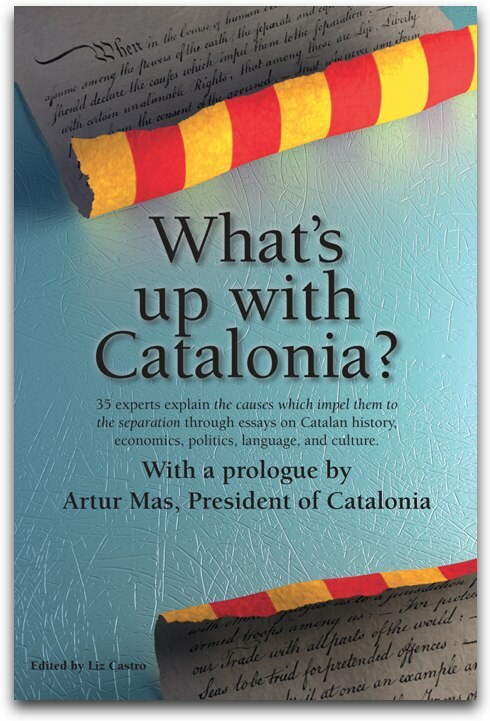 "Reason #247: Spain completed 45% of budgeted infrastructure in Catalonia in 2011. In Madrid, 111%. http://www.ara.cat/politica/Francesc_Homs-pressupostos-Govern-vergonya-inversio_0_784721657.html [ca]"
"Reason #521: Education Minister Wert says independentism linked to Catalan school system. #puleeze http://www.ara.cat/societat/ministre-Wert-lindependentisme-Catalunya-leducacio_0_784721652.html [ca]"
"Reason #1167: Spain insists on costly train thru middle of Pyrenees, and Mediterranean port cities still not connected! http://www.ara.cat/societat/PSC-Corredor-ferroviari-Parlament-Europeu_0_784721633.html"
The random reason numbers were meant to imply that there were lots of other reasons that Catalans want independence from Spain. Then someone asked me for numbers 1-246, and though I haven't written them down, it occurred to me that maybe I should. So I asked people to contribute. Most of the original tweets are in Catalan, and I have translated them into English. I'd be happy to add your reason: just add #raons (reasons) to your tweet or cc me by adding @lizcastro. I will keep updating the list for as long as I can. Note that this is an entirely unoriginal endeavor. Follow @1000raons for more. On Thursday, Oct 4, I decided to start listing them in reverse order, so that the new ones are at the top. 194. Because we have always been Spanish under duress. We Catalans have NEVER admitted to being Spanish. 193. Because we have a history as a nation and our own language that they do not respect. 191. Because I want my son to have better opportunities in the future. 190. Because they've spent the last 300 years trying—often with force—to eliminate our identity, our language, and our culture. 189. I want to stop being independentist and just be Catalan. 187. Because I feel like it. 185. Because I want to live in a normal country. With mistakes and successes. Like any other. And because I'm tired of explaining myself. 183. A sovereign state so that Catalans from different origins can live together without getting poisoned by ignorant and anti-democratic people. 181. To survive, so they don't bury my people in oblivion. 180. Because generations of Catalans have wished for it and because it was taken with violence and has still not recovered. 178. In order to defend and promote our culture. 177. The constant threats made by politicians, and the Spanish press. 176. The constant attacks against our language, which is Catalan. 174. The outstanding debts that Spain owes us and that they don't want to pay. 173. The fiscal plundering of Catalonia, that is the difference between what we pay to Spain and what we get back. 170. Because they took away by force our Right to evolve freely according to our own political and judicial criteria. 169. There always will be differences in classes, but I can't stand that they steal form us. Those who don't love Catalonia don't deserve its money. 168. I can't stand that they steal from us. I have worked for everything I have, while in other autonomous communities they live better on my euros. 167. To recover the lost dignity of our grandparents and to achieve a free country for our children. 166. I don't want to raise flags or borders, but rather free myself of the ones imposed on me by other people. 165. Because I want my kids to enjoy a better life, without being insulted, laughed at, looked down on and abused. 163. Because my 12 year old son has opened my eyes; he sees this as a natural process, without hate or fear. 160. When the heat is suffocating, you have to get out. We can't live in a Spain that looks down on those who don't think as they do. 159. Because we don't fit in there, and they don't accept us either, they keep demanding our taxes and giving us insults and humiliation in return! 158. Because of Antoni Tàpies, because of Pau Casals, because of Antoni Gaudí, because of JV Foix, because of Santi Santamaria, because... need I say more? 157. Because the Spanish state is no longer a useful tool for guaranteeing the freedom, well-being or cohesive and socially just community of Catalans. 155. Because they've been walking all over our culture and our language for 300 years. 154. It's a question of pride now! 153. So we don't have to stomach opinions from people like Joaquin Leguina on Oct 1 in El País, the paper of my own (up to now) country. 152. Because we have nothing in common. 151. Because even if you have a good relationship with the neighbors, everybody sleeps in their own house. 150. Because the fact that they scorn, insult and abandon us, after they've taken our money, has gone on too long. 149. It's the only way to be able to be Catalan, since Spain won't let us. 148. Simply because that's what we want. 147. Justice, basically. Someone who speaks Catalan should have the same rights and obligations as anyone else, and now that's not the way it is. 146. I want to stop being independentist and just be Catalan. 145. So our language will never again be mistreated nor humiliated! 144. Why do we have to give reasons? It's a feeling with which we're born and a dream that we dream. 143. Because I feel Catalan and no one can make me feel something I'm not. 142. Another reason: because of the xenophobic anti-Catalan "reaction" of Spanish society: go look at @apuntem. 141. It's not exactly a reason, but it must be said that it is a radically democratic question. About a people who wants to govern itself. 140. To honor the past of my parents, to make my own present useful, to build a happy future for my children. 139. And among all the reasons, this is the most important: because we are and we want to continue to be. 138. Because we want to be able to decide how much we share economically without drowning ourselves, choose how we spend and where we invest without feeling down and out. 137. Because the ill-feeling that we might generate is infinitely smaller than that which we receive already. 136. Because we do it with hope, not hate. 135. I want the independence of my nation so I can stop being an independentist once and for all and be a normal everyday citizen. 134. Because we tried to modernize Spain without success since the 19th century. We're tired of hitting our heads against a wall of non-understanding. 133. To stop apologizing for being Catalan. 131. So I can leave a future and a Country where my children can live as Catalans, with pride and dignity. 130. Because we have a national anthem, and we'll be able to sing it. 129. We're a country, we don't need any reasons. It's our right. 128. Because we're sick of bullfights and flamenco, those things don't represent us. Our culture is devils and human tower builders and a long etc. 127. More than reasons, I just have one reason. Her name is Laia, she's five, and I want her to live fully free. And that she never has to listen to what I have to listen to and read just because she was born Catalan. I love my land and we don't deserve this treatment. 126. Because I don't want my language to disappear, and that's what the Spanish State is trying to do. 125. Because they want to assimilate us! 123. Because we deserve it and we are capable of making our country our standard, and because we love our land! 122. They've spent the last 41 years telling me what I have to be, feel, and think. I'm not Spanish, I don't feel Spanish, I don't want to have anything more to do with Spain. 121. I don't want my children to be independentist. They have to be free people. 120. They don't let me be Catalan within Spain. 119. I'm tired of a Constitution that doesn't represent me and instead represses me. 118. Because there's no point in being where you're not wanted. 117. Because the Spanish power is inheritance of war, and nowadays, to rule, it's required to be democratically legitimate, and impartial. 116. I don't feel Spanish. 115. In order to have the same civil and political rights as other European citizens. 113. WHY NOT? Because I haven't found a single reason that makes me think I don't want a #CatalanState. 112. Because of the hundreds of thousands of Catalans that have been imprisoned, tortured, killed or forced to exile by the Spanish. 111. It as simple as the fact that I'm Catalan. Period. I don't have to justify myself. 110. 1. For what happened to our grandparents. 2. So that my children live better in their own place. 3. For us. 109. To create a democratic country: a place of liberty and equality, where it's possible to fight unequality and degradation. 107. So we can forget about nationalism and Spanish pan-nationalism. 106. There is no future in Spain. I have two children and I want the best for them. 105. So every day I don't have to justify the fact I am Catalan. 104. I don't want to leave Spain, what I want is for Spain to leave Catalonia for once and for all. Long live ||*||. 103. We want to leave Spain because when they talk about what's "in the interest of all Spaniards" they steal a train or road from us. 101. To speak, sing, read, work, and teach in my own language, Catalan. Without having to fight or justify myself. 100. Because we need to be a normal country, and above all, because that's WHAT WE WANT.99. Foreign mother at the door to the school making an effort to speak Catalan with local father who answers in Spanish. It's not normal, damnit. 98. I don't have anything against Spain or the Spanish, but the language of my parents simply needs its own State. 97. Because our language and culture are different from Spain's and because we have our own identity! 96. More than anything else, a profound feeling of wanting to be. The economic reasons, though powerful, are secondary for me. 95. Even if I earn less, I still want my Catalan passport. I want to go through the world and say "I'm Catalan!" 94. I simply don't feel Spanish. Will we live better? Sure! But it's the same to me if that's not the case. 93. Our own State for self-esteem. I think I've made it hard for you ;o) If they don't want us, why do they want us with them? 92. just because. Isn't it enough in a democratic society? Just bc we want, bc we feel like finishing w/this unequal relation. 91. I have mine and everyone else has theirs, but when the majority of a community wants it, there is no other reason. Catalonia wants it. 89. They say we're Spain's cancer. I don't belong to a fascist country that lies to Europe. We had the first Parliament. 88. Because my Country is Catalonia, I am a Catalan from birth, in my heart, and in my thoughts. It's not about money, it's because I've never felt Spanish nor Italian. 87. cause Spaniards are anxious to force us to give up being Catalan. 86. I can't find any reason for Catalonia not to be a state like any other one in the world. We want to decide on it in a referendum. 83. because you can only be Spanish if you're Castillian, and I'm not Castillian, I'm Catalan. 81. Because living in an independent Catalonia is living in it in its natural state. 77. Because I want Catalonia to be independent in order to be happy, and to honor my mother, who was born Andalusian, but who died Catalan. 76. Because from La Garriga on, the train only has one track. Investment is lacking in Catalonia's basic rail network. 75. Because of the way the Spanish power brokers arrogantly and and meanly take advantage of our money. 74. because Spain does not give us a single good reason. Spain threatens us and speaks only of fear, disaster and apocalypse. 73. Because we want to be and live just as we are, fully. 72. Because we are a Nation, we respect others and we also want them to respect us. 71. So that we can have a more decent and fair society, and social values. 69. Because we want to manage our own money. 68. Because we have the best athletes and we want our own Catalan Team. 67. Because our culture is looked down upon by Spain. 66. Because I say so. 65. 21% VAT on diapers, sanitary napkins, school supplies? Raise VAT on food for gluten-sensitive? 64. We DONT allow animal torture, they want to impose bull fighting in Barcelona. 63. Culture is not a luxury. 21% VAT? 62. We want our roads to be in good condition. 61. If we want to export, we have to have a good rail, air, and port connections with Europe. 59. Why would we choose our people to be poor, unemployed and not to live with certain standards? Again, it is not our choice. 58. Why would we invest our money to develop other regions and let ours die and not achieve its fullness? 57. Economically, it doesn’t make sense. Why would we give away Eur13Billions per year? 56. Today, in 2012 Spain still displays the same attitude as back then; menacing and threating us. 55. Catalonia is in Spain as a result of wars, dictatorships, oppression, coercion, enforcement. 54. Being part of Spain is not natural to us, it was not a choice. 53. For identity. The families in my background were plundered and mistreated for political and cultural reasons. 51. The Spanish State, has been, is, and will continue to be dishonest with any differences with the heart of the "Empire"
50. Because we're an anti-bullfighting country and now Spain's public television is showing bullfights and news about bullfighting when kids are watching. 49. I want to live in a country where the roads all belong to the same agency (not three), who will be responsible for them. Efficiency. 46. I want to live in my country without fear and with dignity and democracy. 45. Because it's horrible being governed by someone who treats you like an inferior. 44. Because there's nothing more beautiful than liberty. 43. Reason #1 must be the fact that Spain refuses to accept the multinational nature of the country. 42. Reason #861: Spain insults Catalans for promoting their language and culture. 41. So I can feel like I have a responsibility to make my country a better place to live. 40. So I can feel like I'm a citizen of the world. 39. Because there are many of us Catalans who want to change and construct a new, better State. Trying to change Spain doesn't work. 38. And above all, because the national project that Spain offers us, doesn't interest us. 37. Because we are a peaceful people and we have the right to choose our own future democratically. 35. Because we want to be able to decide which infrastructure is a priority for Catalonia and where we want to invest our taxes. 34. I want Catalonia to be independent... I want it to recover the freedom it had and which was taken from us by KILLING PEOPLE. 33. Because we are a hopeful, productive, unstoppable country. Presently, we're stuck. 32. Because we want to have our own, advanced, pedagogically modern Education Law instead of changing it 7 times in 30 years. 31. Because we are a manifestly different people from the rest of the Spanish and we don't feel very comfortable living with them. 30. Because we are democrats par excellence and we respect the right to decide. 29. Catalonia must be independent for many reasons. In short, because that would be normal. 28. Because we want to manage our own airport that will connect us with the world. 26. Because we have a country with an enormous potential that until now they have not let us take advantage of ourselves. 25. Because Spain has never had a Truth & Reconciliation Commission, fearing the consequences. 23. Because we are Catalans and we want to be Catalans. 21. because it is the desire and hope of all Catalans, and it was that of many older people who lost their liberties and died oppressed. 20. To compensate for the rights we lost to the armies of 1714. 19. Because it would end a historic confrontation and would contribute to a better world. 18. Because it is time to end the forced relationship between two substantially antagonistic peoples. 17. Do the inhabitants of the other 193 countries in the UN have to give reasons? 16. Survival. It's the only possible answer to oppression so as to not lose one's identity. 15. Because I want to live in my country, and not in a colony that smothers me. 14. Because I feel like it! 12. To benefit from what we generate economically, and thus not be fiscally plundered. 11. Because we are a nation with our own language, culture, and history and we have the right to democratically decide our future. 8. Because WE ARE DIFFERENT! Neither better nor worse, DIFFERENT. Socially, culturally, and professionally different. 5. Because profits made thanks to private investment by Catalonia in the Port of Barcelona go to Spanish ports. 4. Because forced dependency strangles liberty and the economy. 3. Because they won't let us have an airport with intercontinental flights. 2. Because Spain's investment policy hurts us on every level. 1. Because we have mountains, valleys and beaches, because we have big cities and small towns. Because if a piece of territory is in dispute, the question of "who it belongs to" should be decided by those who live there, or a majority thereof. Catalonia lost her freedom by war, against the will of Catalan people. So, Catalonia remains a sovereign country de jure. Catalonia will not be ruled by any Spanish law if Catalan people, democratically, decide the contrary. Because we DO NOT want our elders to pay for their wastes of money. Because we want to know perfectly what our financial situation is at any time. Because Spain is outdated, and it only represents a heavy load for anyone who partners up with it. Because we do not want to be seen as those who worship an old man who cannot speak even his own language properly, a man who behaves correspondingly to his IQ of -50. Because we want to be represented by a man who does not look like a bulk, who does not speak incorrectly even his own language. A man who speaks many languages fluently, a man who's presence induces respect and admiration, a man who can raise whole populations to defend what ethically corresponds to them, a man like Artur Mas. Because its time to recognice cultural diversity and identify natural states,the world have in off artificial empires.